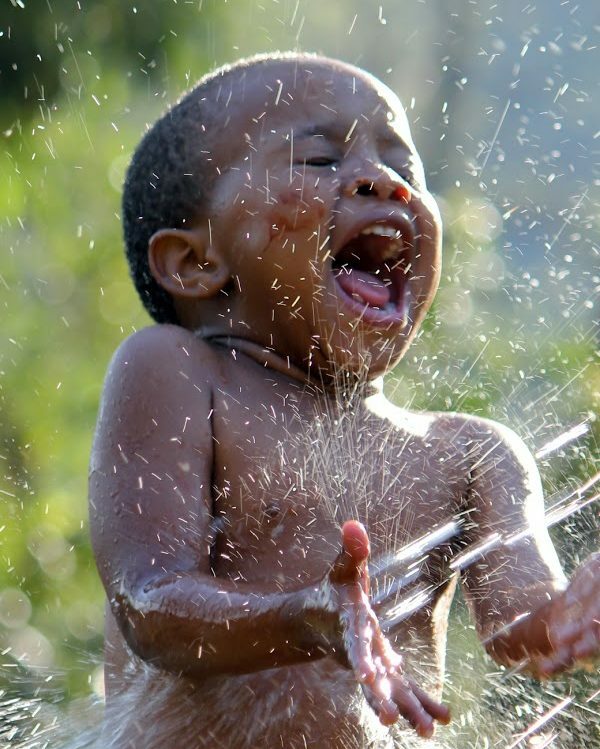 Imagine: you wake up in the morning refreshed and full of energy, do your Morning Ritual (CLICK HERE for details), enjoy your morning meal, kiss your loved ones and wish everybody a good day hearing the same in return, leave your house with a smile and anticipation of a productive day… and then life intervenes. There will be many of small and not-so-small things happening to you, stressors piling up, people jumping in and out of your personal space – and your morning smile will quickly vanish being replaced with frowns, tight lips, tense shoulders, and other signs of chronic stress habitually settling in. In that state you get easily up-set, and the further your day goes the more difficult it is for you to stay centered, motivated, and productive. Sounds familiar? Amongst many things that may affect your balance during the day human interactions are probably the most difficult to handle, and some of them can actually pose a threat not only to the brightness of your day but also to your overall wellbeing and, in the long run, even your health. Here is an example. Whether you recognize the existence of human energy fields and transfer of energy between living things or not, you can’t deny the fact that interactions with some people consistently leave you feeling down, drained, depressed, weak, and “out of sorts”. Sometimes you even get a headache, feel dizzy, and need a food or a drink. (This phenomenon is often described as encountering “energy vampires” or “psychic vampires”.) If you do not develop a skill to protect yourself, such repeated occurrences often lead to chronic health problems. There are many different ways that have been recommended to counter the effects of upsetting everyday events, but unless you are a Zen master, it is still VERY difficult to stay positive, focused, and productive in the midst of a tornado of daily stressors of various sizes. The Healing FUSION owners have an advantage though. You can successfully use your SCENARs, COSMODICs, and Low Level Lasers to quickly regain the state of balance immediately after any upsetting encounter. We call it the “Bounce Back” Protocol. Actually, it is not a separate Protocol, but rather a combination of already known and proven in practice techniques. Depending on which part of the Healing FUSION you have, you can utilize one or another part of the recommended actions below – and the sooner after the affecting event you do it the better, before your stressor creates the “domino effect” in your energy body. The best technique to get back your coherent state with SCENAR or COSMODIC device is the well-known and well-done “Energy Cleanse”. It is quick and effective, and does not require any particular skill. The only problem is – you can’t do it yourself, and you have to have your back bare. You do not always have these luxuries in the middle of the day and in your workplace. But not to worry, there are other ways. There are seven particularly important points on your head that you can influence with SCENAR or COSMODIC device in order to regain composure and mental clarity. And no, these are not the famous “7 Points on the Face” from the 3P7P protocol, even though they would be good to include also, if you have time. These are three pairs of points + 1 single point. First pair: the right mastoid (the point below and slightly behind the right ear) – the left temple. Second pair: the left mastoid (the point below and slightly behind the left ear) – the right temple. Third pair: the C1 (or Atlas, or the very base of the skull – the “third eye”. 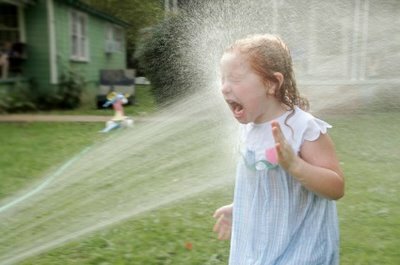 Single point: on the very top of your head, just spread your hair and try to get the skin contact. If your hair is too thick, slightly moisturize it with water for better conductivity. 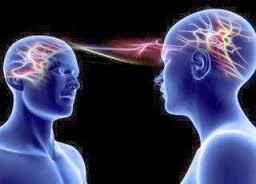 This point is very important; it’s your Crown chakra; you want it to be open. 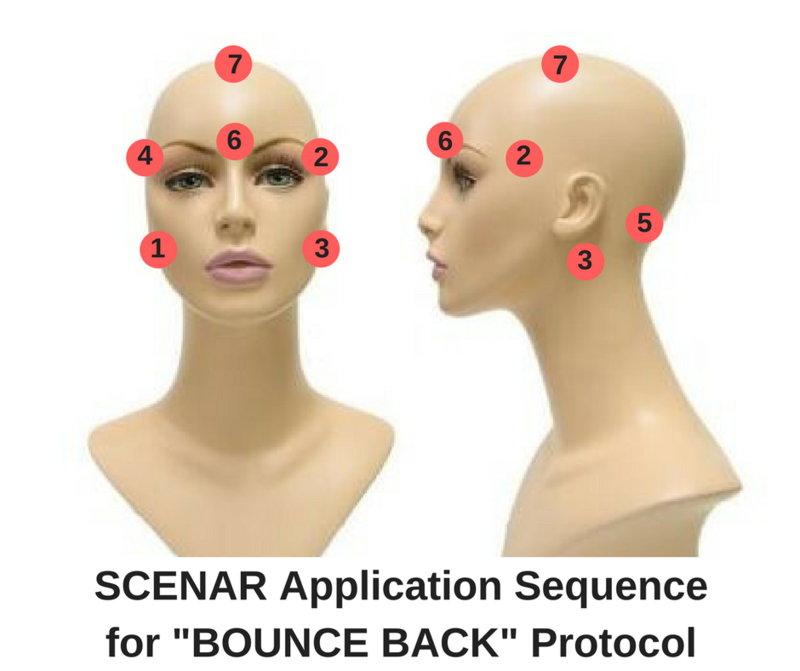 The points are better to influence in the mentioned order, which corresponds to the classical vector of SCENAR application on the head: from right to left and from bottom to top (if you are treating yourself). If you have the first generation SCENAR, use the maximum variety of signals (FM/Var, or Swing modes, or Bio settings – whatever you can get from your device). If you have COSMODIC, just put it on Auto settings and let the device decide. For EX735 Sliders, SCENAR-COSMODIC Slider Auto would be the best mode. The idea is to introduce as much dynamics into the situation as possible. You do not have to spend a lot of time on each point; 1-2 min. should be enough. Of course, the pairs of points are best influenced simultaneously – that is, if you have a pair of remote electrodes to use. We prefer shungites, but stainless steel ones will do too. And if you do not have such attachments, work on the points one-by-one, in the order I mentioned above. If you have a resonating LLL, such as the SWL (Scalar Wave Laser), or the QLaser, or the EnerChi, you can use the same points as described above. Just make sure that the Mode you are using is suitable for the brain (for example, for the QLaser that would be Mode 2) and you are not using too much light; 30 sec. on each point should be enough to increase your coherence level without overwhelming. In addition, use your resonating laser on the Heart chakra (in the middle of the sternum) in the appropriate mode (again, Mode 2 for the Q1000 or Q10). Here you can stay longer. In fact, the duration is very individual and depends a lot on how much “out of it” you are and how depleted your “biological battery” is at the moment. Usually, the involuntary deep sigh is an indicator that you’ve got enough. With the resonating low level laser, the sequence of points to influence does not matter as much as with SCENAR, but we find it the most beneficial to “charge” the Heart chakra first. Sometimes that alone may be enough to restore your balance. If you are using a combination of the LLL and SCENAR/COSMODIC, the effect will be much quicker, more profound, and longer lasting. We, however, do not want to limit you to our recommendations on how exactly these two technologies should be combined. You know the main points to influence – create the patterns that work FOR YOU. Whenever you feel “out of it”, upset, thrown out of balance; when the mental fog sets in; when you can’t concentrate and find your mind constantly wondering or going in circles; when you feel nervous, anxious and can’t relax; when you feel down and energy drained; when you can’t make a decision or move forward; when the “mind chatter” becomes particularly loud and intrusive – and in any other situation that takes away your morning smile along with your energy, creativity, focus, and motivation. 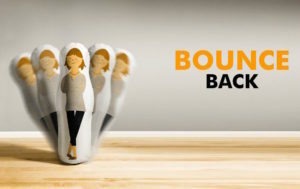 We find the Bounce Back Protocol to be particularly effective in dealing with the consequences of interactions with those above mentioned energy vampires (or psychic vampires). This phenomenon is a subject of a whole another conversation, but we believe it is very real and actually quite detrimental to your well-being and ultimately to your physical health. And even though you often cannot avoid such people in your surrounding (for example, if they are colleagues or family members), at least now you have a way to quickly bounce back after being thrown off balance by their poisonous comments, or eternal drama, or non-stop whining, or non-stop talking (ANYTHING to get your attention that provides a connective channel to your psyche). In its essence, the Bounce Back protocol is a “quick fix”. It does not actually treat your problems, whatever they may be; it just helps you regain the state of balance when you lose it. On the other hand, it is much easier to deal with problems, when your mind is clear and you are centered and focused. May you always find your center and have a way to get back to it, Home Healers. P.S. Even though the Bounce Back Protocol can help you stay positive and productive during the day, don’t forget to take good care of yourself when your work day is over. Take a quick shower (running water does wonders for your energy field), walk barefoot on a grass to ground yourself, play with your pet, snuggle in the SOLARIS Blanket for 20 min., do your Evening Ritual. Do that or anything else that works for you… if you want to find yourself smiling in the morning.